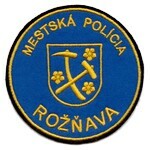 Rožňava’s city police were established in 19 December 1990 upon Rožňava City Council Resolution No. 1/1990. Competencies assigned the city police are laid down in Slovak National Council Act No. 564/1991 Coll. on General Policing as amended. The city police are a law enforcement unit actively responsible for ensuring public order is maintained in city limits, protecting the environment in the city and fulfilling other tasks defined in generally binding city ordinances, city council resolutions and mayoral decrees. The Rožňava city police force is currently 16 members strong. reviewing suggestions from residents concerning city police officers and their activities. A deputy chief stands in for the city police chief during absences. - fulfils other tasks ordered by the city police chief. - fulfils tasks assigned by the shift commander. - checks for compliance with public order across the city and conducts the same activities as the 6 AM to 2 PM shift. - checks for compliance with public order across the city, especially in problematic locations (public areas in front of bars, clubs, pubs and in the city centre). Patrols employ a suitable combination of foot, bicycle and motorised patrols. A sheltered workplace was established at Rožňava city police on 1 May 2009 for a total of 3 disabled workers. These workers operate the city’s CCTV camera system on two shifts during regular business days. The city created service districts to bring Rožňava city police closer to city residents, to build personal relationships and local knowledge and to improve the personal engagement of Rožňava city police officers in their assigned activities.